A comprehensive selection of sensors, software and accessories for the HOBO® range of data loggers. Direct Read Sensor Cable for MX2001 Water Level Logger. 5m length. Direct Read Sensor Cable for MX2001 Water Level Logger. 10m length. Direct Read Sensor Cable for MX2001 Water Level Logger. 15m length. Direct Read Sensor Cable for MX2001 Water Level Logger. 30m length. Direct Read Sensor Cable for MX2001 Water Level Logger. 60m length. Pack of Lithium AAA batteries where expected temperatures are expected to fall below -20'C. For use with Hobo Node Repeater (W-REPEATER). Locking well cap for mounting HOBO Water Monitoring loggers in wells. Used with the HOBO MX2001 it supports the logger at the top of the well for optimal wireless transmission range. The ARA is a 2-Zone Battery Operated Remote Alarm device with audio and visual alarm indications. Designed for use with HOBO U14 LCD Data Loggers and other monitoring equipment with relay output. Protective Housing for Hobo U20 Water Level and U24 Water Conductivity / Salinity Data Loggers. HOBOware is entry-level software for HOBO USB loggers, offering easy logger launch, readout, and data plotting. It includes both Windows and Mac versions of the installer and a USB interface cable. HOBOware does not support any of Onset's data assistants or data shuttles. 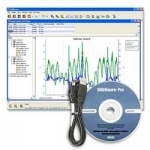 HOBOware Pro for Windows is part of Onset’s software suite for logger management, data graphing, data analysis, and data export. It includes a USB interface cable. The optional HOBO Water Temp Pro thermoplastic elastometer boot provides cushioning for use in harsh conditions — offered in black to minimize underwater visibility. The optional TidbiT thermoplastic elastometer boot provides cushioning for use in harsh conditions — offered in black to minimize underwater visibility. The optional TidbiT thermoplastic elastometer boot provides cushioning for use in harsh conditions — offered in white to minimize solar radiation absorption. The optional HOBO Water Temp Pro thermoplastic elastometer boot provides cushioning for use in harsh conditions — offered in white to minimize solar radiation absorption. Replacemant Pendant Coupler for BASE-U-1 Optic USB Base Station. Replacement Coupler for Pendant Data Loggers. For use with U-DTW-1 Waterproof Shuttle and BASE-U-4 USB Optic Base Station. Replacement Coupler for U20 Water Level Loggers. For use with U-DTW-1 Waterproof Shuttle and BASE-U-4 USB Optic Base Station. Replacement Coupler for U22 Water Temp Pro v2. For use with U-DTW-1 Waterproof Shuttle and BASE-U-4 USB Optic Base Station. Replacement Coupler for TidbiT v2 Temperature Data Logger. For use with U-DTW-1 Waterproof Shuttle and BASE-U-4 USB Optic Base Station. Coupler for the HOBO Pro v2 series for communication with the Universal Base Station, U-DTW-1 Waterproof Shuttle and BASE-U-4 USB Optic Base Station. Half Cross Arm for mounting Hobo Wind Sensors to Hobo Tripods or masts, offering unobstructed Wind Measurement. Light Sensor bracket for attaching the Hobo PAR/Solar Radiation sensor to a Hobo Mast or Tripod. M-SKA 0.5 Tripod Stake kit",28.0000"
With the Protective Case, the U14 LCD logger can be mounted wherever you need a real-time data display, data logging and alarm initiation – even in wet, dusty, or condensing environments. The U20-CASE-1 is a hard-sided case with foam inserts that holds four HOBO Water Level Loggers and an Optic USB Base Station or Waterproof Shuttle.